Loans extended to wholesale, retail, restaurant and accommodations businesses, most run by self-employed individuals, gained by the fastest pace of 11 percent last year to top 200 trillion won ($177 billion) for the first time, underscoring the hardship of street business and devastation of self-employed population in Korea due to protracted economic slump and increased labor cost. According to data released by Bank of Korea on Wednesday, commercial and industrial loans extended to wholesale, retail, restaurant and hospitality businesses from banks and non-banking lenders amounted to 200.2 trillion won by the end of last year, jumping 10.7 percent from a year ago. The year-on-year gain is the biggest since the central bank started compiling such data. C&I loans extended to all businesses including self-employed amounted 1,121,2 trillion won as of late last year, up 14.3 trillion won from three months ago, data showed. C&I loans refers to loans extended to a business rather than an individual customer by depository banks and non-bank depository institutions like savings banks and credit unions. They are made to provide working capital or finance large capital investment. 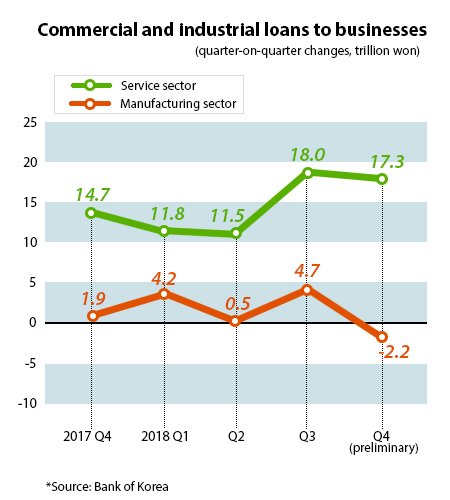 By industry, C&I lending to the service sector stood at 677 trillion won by the end of the year after adding 17.3 trillion won from the third quarter and 9.5 percent on year, the biggest increase since data was traced from 2008. Lending to manufacturers amounted to 344.8 trillion won, up 2.1 percent on year. It was down by 2.2 trillion won against a quarter ago for the first time in two years in line with the fall in facility investment last year. 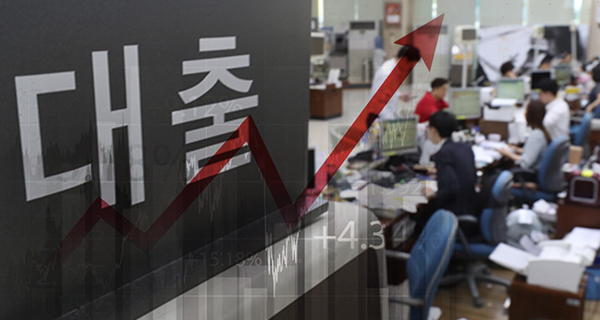 Loans extended by depository banks gained 5.8 trillion won, and those made by non-bank depository institutions expanded by 8.5 trillion won during the period. Meanwhile, debt of self-employed individuals jumped to 609.2 trillion won as of late September last year, stretching as much as 60 trillion won from the end of 2017.